The key point of Kerry’s speech was the assertion that in today’s historical conditions, the U.S. views the states south of the Rio Grande as «equal partners» which must «promote and protect…democracy,» «sharing responsibilities [and] cooperating on security issues». It is difficult to interpret these wordings clearly. On the one hand, Washington seems to be stating that it will not resort to armed intervention in the region to defend its «vital interests». On the other hand, the statements about «sharing responsibilities» and «cooperating on security issues» sound quite equivocal. Cooperating with whom, exactly? Against whom? And on what terms? However, against whom the «cooperation on security issues» is to be directed follows from the speech itself. 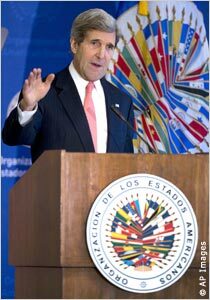 Kerry assailed Venezuela and Cuba with criticism. In his opinion, «democratic institutions are weakened» in Venezuela. Most likely Washington is irritated by the fact that the National Assembly voted to give President Nicolas Maduro special powers which he has already begun to use to stop the economic war on Venezuela (speculation, hoarding consumer goods and food, and undermining the purchasing power of the national currency, the bolivar). Venezuelans approve the measures being taken by President Maduro. The authority of the Bolivarian leadership has grown noticeably. In Cuba the head of the State Department is dissatisfied with the pace of the democratic process. Kerry stated that the U.S. hopes these processes will gain speed, that «the Cuban Government embraces a broader political reform agenda that will enable its people to freely determine their own future». And the U.S. would very much like the process of democratization in Cuba to take on a landslide-like character, similar to the process which destroyed the USSR. The U.S. has shelved the Monroe Doctrine, but it has not given up pressuring Latin American countries or conducting complex operations to destabilize them. Targeted propaganda attacks are carried out against undesirable leaders. Streams of slander pour down on Bolivian President Evo Morales, first and foremost because of his government’s «insufficient efforts» in fighting against illegal coca plantations and drug trafficking. And this when Bolivian intelligence agencies are battling fiercely with drug cartels financed, as a rule, though banks controlled by U.S. businessmen and the Drug Enforcement Administration (DEA). Morales gives as good as he gets, confident that the best defense is a good offence. He has more than once advocated handing over Barack Obama to a «tribunal of the peoples» to be tried for «crimes against humanity». His accusations were loudest of all in his address at the 68th session of the UN General Assembly. The Bolivian president claims that in order to maintain its dominant position in the world, the U.S. makes use of the most criminal of methods, extensively organizing conspiracies and assassination attempts. Morales has reduced contacts with representatives of the U.S. to a minimum, preferring to conduct business with China, Western European countries, Russia and Belarus. The president of Bolivia has threatened, «If we need to, we will close the U.S. embassy altogether». Washington has never ceased its hostile activities against Ecuador. After the CIA’s failed attempt to get rid of President Rafael Correa using agents in the Ecuadorian police, the U.S. embassy is sparing no efforts to «reform» him. Adam Namm, the American ambassador in Quito, criticized President Rafael Correa for cultivating closer relations with Iran and Belarus. The response was immediate: «I am not surprised at his [Namm’s] pronouncements, because the diplomat is new at these issues. Ecuador will not ask permission from anyone to maintain sovereign relations with whatever countries it wishes. It is enough to note how many countries where absolutely no elections are held at all have privileged relations with the United States. Absolute monarchies! So that’s enough! We are not anyone’s colony. While I am the president of this country, there will be no neocolonialism!» Correa’s harsh comments on Obama’s pronouncements about the «exceptionalism of the American people», who are supposedly concerned with protecting the interests of «all humanity», are also conspicuous. The Ecuadorian president compared these claims with the «Nazi policy» of the Third Reich. In October Correa visited Russia, where he discussed, among other things, armaments cooperation issues and shipments of Russian armaments to Ecuador, in particular air defense systems, as well as an additional shipment of Mi-171E transport helicopters. Russia is interested in implementing several large oil and gas projects in Ecuador. The Ecuadorians are discussing prospects of intensifying military cooperation with China; recruiting Chinese specialists for the construction of an oil refinery (Refineria del Pacifico), to be completed in 2017, has also been proposed. Even now there are 60 Chinese companies working in Ecuador in the mining industry and road infrastructure construction. All of this is causing great concern in Washington, which is why the spying activities of American intelligence agencies have intensified in Ecuador. According to the site Contrainjerencia.com, in 2012-2013 the number of CIA personnel at the Ecuadorian station doubled. Agents with experience in subversive operations in Latin America are being sent to Ecuador: U. Mozdierz, M. Haeger, D. Robb, H. Bronke Fulton, D. Hernandez, N. Weber, A. Saunders, D. Sims, C. Buzzard, М. Kendrick and others. The problems which Washington is now having with Brazil and Argentina due to the scandalous revelations regarding the wiretapping of these countries’ presidents, Dilma Rousseff and Cristina Fernandez de Kirchner, have yet to be resolved satisfactorily. The Americans have still not really apologized for the total espionage in these countries. And the espionage not only has not stopped, it has become more subtle, forcing national intelligence agencies to develop joint measures to combat the operations of the CIA, the NSA and U.S. military intelligence. At the same time, steps are being taken to create a system for fighting electronic espionage within the framework of the Union of South American Nations (UNASUR). In Mexico and the countries of Central America and the Caribbean Basin, American intelligence run things with almost no interference, unless you count Cuba and Nicaragua, whose counterintelligence agencies occasionally strike painful blows against the CIA’s agent network. Today the most important task for U.S. military and intelligence agencies is maintaining control of Honduras, which is often called the «unsinkable aircraft carrier of the U.S.» in Central America. There are already U.S. military bases located on the territory of Honduras, but the Pentagon is planning to build new air and naval bases. Washington’s cynical interference in the election campaign which just took place in Honduras is yet another signal from the Obama administration to Latin America: we will protect our interests at any cost; no other outcome is acceptable to us. The «U.S.’s man» in the elections in Honduras is Juan Orlando Hernandez, the candidate from the conservative National Party. For over three years he headed the National Congress and contributed greatly to the consolidation of political forces hostile to ex-president Manuel Zelaya and his wife Xiomara Castro. It is she who was his main competitor in the elections as the candidate for the center-left Liberty and Refoundation Party (LIBRE). Hernandez supported the 2009 military coup d’état which led to the overthrow of Zelaya, maintains close ties with the military, and facilitated the expansion of the «security» functions of military personnel, including in fighting drug trafficking. For the U.S. embassy, not allowing Xiomara Castro to come to power is a matter of principle. Upcoming events will show how it will be resolved. In a radio interview with Radio Globo, Manuel Zelaya stated, «Xiomara has won the fight for the post of president of the republic. They [the Supreme Electoral Court of Honduras] are stealing the victory from Xiomara Castro. The Court’s count does not stand up to statistical analysis. We do not acknowledge this result; we reject it». Lisa Kubiske, the U.S. ambassador in Honduras, actively interfered in the election process in order to guarantee victory for Hernandez. In essence, it is she who is Xiomara Castro’s main rival. Whether the U.S. embassy will be able to ensure that Hernandez comes to power will be seen in the near future. But there is already information in the international media that in the process of counting the votes, he is leading by a wide margin.